Dj Gringo & Dj Fyahrama and Bembe create an oasis under the bridge every Tuesday night spinning nothing but Lovers Rock, Conscious Dance Hall, and Roots like no one else! Experience real Reggae every Tuesday night! Flyer says it's free which makes sense being that it's on a Tuesday. Imagine my surprise when the bouncers tried to charge my friend and I $25 each to get in along with some bs about not having women with us. Skipped it and had fun someplace else. Stick to Reggae Retro where you know the cost up front and it's well worth it. One of the most original, best reggae parties left in NYC; Dj Gringo at his best- the place gets packed at 10:30, so get there by 10!!! Big up Junior Keys on the early vibes!! Always IRIE, and original! I am not paying $20 to go drink and listen to music in a steam room. Is a robbery! This is one of my favorite reggae spots in NYC, great music, friendly people, when in NYC it is a must go to spot. Music there was commond I thought I was listing to Internet radio. to much hype about the Dj.. Place small as hell.. Not a good place to dance at all. 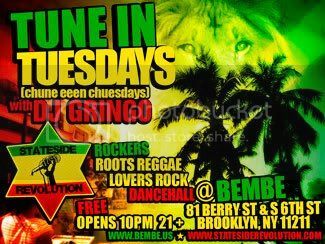 Will not go back and I bet i will not miss anything..
Love my Bembe Tuesdays especially when Gringo plays. He provides a great mix of culture, reggea, dancehall and soca when he's feelin' naughty! The female dj is whack, she plays all the songs that came out from that one riddim consecutively...how boring! Drinks are inexpensive. My fav is the rum punch ($7). It gets crowded at about midnight. A good place to go out dancing with your mate or just to hang with the gals. The spot is small and intimate and the crowd is mixed. My fav Tuesday spot; I will always go back! DJ Gringo need to go shopping playing all that old music and not even retro. Also, when did you become a Soca man? I remember the wicked culture sessions Gringo was known for. I guess nothing stays the same. Step your game up Gringo. This is one of the coolest venue's in Brooklyn. It has an ecclectic museum feel, interesting and cool. Words aren't sufficient to illustrate the mastery of Dj Gringo. She killed it. Love her style and the way she spins a perfect web of reggae flow. The crowd is a nice balance of different types of fun loving kook kat like people. I have a great time everytime at Bembe. Its one of my favorites on this website. Guaranteed positive vibes at Bembe. The atmosphere at Bembe is so warm and cozy mixed with Dj Gringo's vibe and positive, conscious dance hall, and lovers rock makes me want dance and smile all night long every time!